Alexis Tsipras with Independent Greeks leader Panos Kammenos. Flickr/sher xla. Some rights reserved. In a recent article in The Guardian, Dan Hancox argued that parties like Syriza in Greece and Podemos in Spain have been successful because of their progressive populist rhetoric, which embraced ideas of ‘the people’ against internal and external economic elites rather than traditional Marxist class struggle. This strategy Hancox connects to Ernesto Laclau and Chantal Mouffe’s idea of ‘radical democracy’, which sees populism as a useful tool in the struggle for socialism. These ‘populist’ ideas were indeed strongly present in the movements and protests that challenged previous governments and led to the popularity of both Syriza and ANEL. But closer to the January 2015 elections, and increasingly after the formation of a coalition government, Syriza has relied more on nationalist/patriotic language than on challenging the elites within Greece and the EU. 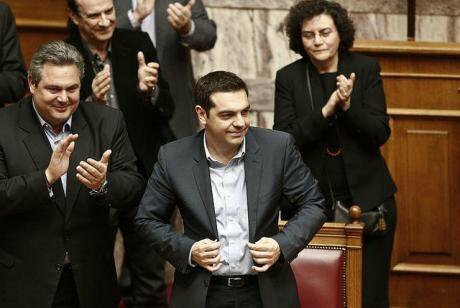 Two weeks before the elections, Alexis Tsipras promised to form ‘a government for all Greeks, not just one political side’, while in his emotional first address to the parliament as prime-minister he declared the formation of a ‘government of national salvation’. At the same time and as part of a patriotic repertoire, an external ‘other’ has been constructed through the development of an anti-German narrative, which was evident in past anti-austerity mass mobilisations and more recent pro-government protests during the EU negotiations. The anti-German rhetoric has claimed its legitimacy largely on the basis of an anti-Nazi trope and by making references to Greece’s resistance to Nazi Germany during WWII. This perspective seems to resonate with some members of the new Syriza government. Nikos Kotzias, for instance, the Minister of Foreign Affairs, has regularly reproduced an argument originally presented in his book ‘Patriotism and the Left’ about the need to distinguish between ‘good’/necessary patriotisms and ‘bad’ nationalisms; the former is associated with anti-colonial and/or socialist movements, like in India, Latin America and China, while the latter refers to imperialist states like Germany. Their past as imperialists is what, according to Kotzias, makes countries like Germany refrain from overt expressions of ‘patriotism’ found in other countries who are ‘proud’ of their struggles for national independence and sovereignty. Of course not all nationalisms are the same in terms of their formations, agendas, articulations and power dynamics. A strict separation between patriotism and nationalism, however, can be misleading and may entail risks. As empirical and historical evidence from multiple contexts show, the boundaries between the two are often blurred. Anti-colonial nationalist struggles can also involve violent conflict and intolerance towards internal ‘others’; Cyprus is an obvious example close to home. Moreover, patriotism, as a form of nationalism, does not only mask internal power dynamics and class struggles by creating a false image of a unified ‘self’, but it also prioritises this ‘self’ over other political alliances and formations across and beyond borders. a) By adopting a nationalistic rhetoric, Syriza ignores the class dimensions of the economic crisis and deflects attention from the Greek oligarchs who systematically profited from it. By recalibrating the anti-austerity cause as a Greek struggle against Germany, the implication is that Greece will either succeed or fail as an entire nation. This, however, masks the institutionalised inequality within Greek society and betrays the movements of the unemployed, the poor, and the disenfranchised that brought Syriza to power. b) As a strategic move towards overthrowing austerity all over Europe, this is a poor one. By presenting themselves as the spokespersons of a nation struggling to survive, Tsipras’s team have indeed managed to create solidarities abroad. How effective are these going to be in the long run, however, if they are supporting a one-off, nation-driven negotiation, rather than speaking on behalf of a generalised radical movement against neoliberalism? Syriza has a real opportunity to re-appropriate populism and respond to conservatives and neoliberals who use it as an (often void and generalising) criticism in order to undermine alternative political voices. But it should be the sort of populism that brings radical democracy by giving voice to those most affected by neoliberal re-structuring in Greece and across Europe. Their voices should not be sacrificed for ‘the salvation of the nation’.